What just happened in Europe? The short answer is T-LTRO. The ECB is getting back to being “accommodative” again. This isn’t what was supposed to be happening at this point in time. Quite the contrary, Europe’s central bank had been expecting to end all its programs and begin normalizing interest rates. The euro and euro zone government bond yields fell sharply on Thursday after the European Central Bank changed its rate guidance while banking stocks tumbled as a fresh round of cheap loans was less generous than previous packages. TARGET2 is the system set up in the euro-zone to clear inter-bank payments. The Bundesbank (Germany’s central bank) describes it as a payment system that enables the speedy and final settlement of national and cross-border payments. The problem is that often there is no “final settlement” under TARGET2. Instead, credits and debits can build up indefinitely. To understand the issue it first must be understood that although the 19 countries that comprise the euro-zone use a common currency, the euro-zone isn’t really a unified monetary system. It is more like 19 separate monetary systems, each of which is overseen by a National Central Bank (NCB). These NCBs are, in turn, overseen and coordinated by the ECB. TARGET2 is the means by which money is transferred quickly and efficiently between these 19 separate monetary systems. The transfer may well be quick and efficient, but, as noted above, it often doesn’t result in final settlement. Just in time to follow closely upon yesterday’s European circus, IHS Markit piles on with more of the same forward-looking indications looking forward the wrong way. Mario Draghi says the ECB is ending QE, good for him. The central bank will do this despite balanced risks rebalancing in a different place. The more bad news and numbers stack up the more “they” say it’s nothing just transitory roughness. Globally synchronized growth is dead, that much is for certain. There wasn’t much decoupling anywhere in between. In between what? This is how it always goes, each and every time. From 2003 to 2009, it went: globally synchronized growth, decoupling, globally synchronized downturn. From 2010 to 2012, it went: globally synchronized growth, decoupling, globally synchronized downturn. From 2013 to 2016, it went: strong global growth (not synchronized), decoupling, synchronized downturn. Last year to this year, it has gone: globally synchronized growth, decoupling. What comes next? They would also like you to believe that what does come next is some way distant, small probability fuzzy concept. These slightly less optimistic risks proliferating across key markets is an annoyance, nothing more. A recession maybe kinda in 2021 or 2041, an old business cycle losing some of its momentum. QE is that important. And for this week’s second headline event, here comes Draghi. On Sunday, we brought you “Rome May Be Burning, But Draghi Is No Longer Your Fireman: What To Expect From The ECB“, which, as the title suggests, was a post about what to expect from the ECB (no false advertising here). To be clear, they need to start taking big steps down the road to normalization. They’ve tapered, but the balance sheet is still growing and they’re still mired in NIRP. Apparently, the deceleration in eurozone economic activity in Q1 and the political turmoil in Italy isn’t enough to prompt the ECB to take next week’s meeting off the table when it comes to making a potentially momentous announcement about when APP will ultimately be wound down. Reports on Tuesday confirmed that next week’s pow wow is indeed “live” and that gave the euro a boost. Well fast forward to Wednesday and a trio of ECB officials were out noting that the debate will be front and center next week. It doesn’t come as a surprise that for some time now, financial market participants have been expecting net asset purchases to end before 2018 is out. As things stand, I find these market expectations plausible. This will be the first step on a long path towards monetary policy normalization. Inflation is now expected to gradually return to levels compatible with our definition of price stability. The concept of bank reserves grew from the desire to avoid the periodic bank runs that plagued Western financial systems. As noted in detail starting here, the question had always been how much cash in a vault was enough? Governments around the world decided to impose a minimum requirement, both as a matter of sanctioned safety and also to reassure the public about a particular bank’s status. Later on, governments added other forms of bank “reserves” which could be used to satisfy any statutory deposit requirement as opposed to actual depositor needs or desires. Typically tied to the level of reported deposits, a depository institution could use not only cash and money but also any positive account balance drawn from a central bank window or liquidity program whether or not there was any actual cash or money associated with it (almost always never). The implicit assumption is that a positive reserve balance can be made into actual cash or converted into money because of the central bank’s ability to print the former and mobilize its holdings of the latter. Earlier this week the FOMC published the minutes of its April policy meeting, disappointing “dovish” in them which more properly suggests skepticism about the state of economic affairs. Yesterday, it was the ECB’s turn. Releasing the “Account” of also its April gathering, Europe’s central bank began it by noting Germany’s federal securities. Specifically, it mentions yields falling back on them. With regard to recent bond market developments, a gradual decline in the ten-year German government bond yield, which started in mid-February, had pushed yields back to levels not far from those observed for most of 2017. So much for growing evidence of Europe’s boom hysteria. In fact, most of the Account is written to convey growing uncertainties about it all. Germany’s bund market is therefore a very good place to start. We can do so, however, in a manner in which authorities never do. 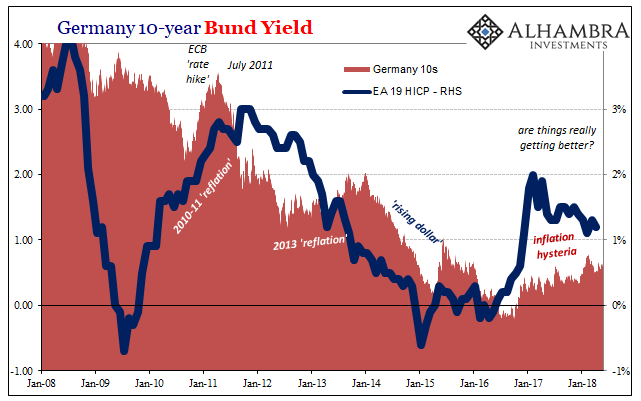 They quite intentionally frame any discussion about bonds, bunds, or whatever in as short of a perspective as possible. As the quote above demonstrates, that way they can make it seem like progress if yields rise more in 2018 than in 2017 (until even that stops) without having to explain why those same yields remain still nowhere close to 2014, 2011, or normal. Not being so narrow of focus, instead we can better appreciate just how little German yields have changed in comparison to where they were or would be if there was anything like an economic boom afoot. Sustained economic weakness is therefore consistent not surprising or unexpected. Money is following to European stocks as jitters struck the US stock markets and The Federal Reserve continues to slowly normalize its monetary policy. (Bloomberg) — Billionaire Ray Dalio has $18.45 billion in bets against Europe’s biggest stocks. Most of the rest of the investing world is headed in the other direction. U.S. stocks lost $9.7 billion in investment so far this month while Eurozone shares have gained $3.2 billion, according to data compiled by Bloomberg. Peers of Dalio’s firm, Bridgewater Associates, are mostly wagering that Eurozone equities will rise. Dalio has always marched to the beat of his own drummer, so his big short position, especially when other hedge funds are betting in the opposite direction, could be seen in that context.